Show Your Support for USA Soccer! So I meant to write this post last week, but there has been soooooooooooo much going on here lately! Having booked their place a few days earlier with a win against Honduras, the US National soccer team wanted to make sure got on that plane next summer to South Africa having been top of the qualifying phase with CONCACAF , their respective Federation! The guys completed World Cup Qualifying this past Wednesday evening with a thrilling draw vs a determined Costa Rica side on a late Jonathon Bornstein goal! It was a long and hard road to get there, but at the end of the day we will have the chance to go to South Africa next summer and compete with 31 other nations for a World Cup Title! Speaking of titles and competing, Tampa Bay & Company is requesting the support of community members, partners, Tampa Bay fans, and everyone else to help bring the World Cup back to the United States and to Tampa Bay for the first time. The USA Bid Committee has created a petition campaign to help show the level of dedication our community has to hosting the FIFA World Cup™, and we have set a goal of 50,000 signatures. Tampa Bay is one of the 27 USA finalist so we need your help! 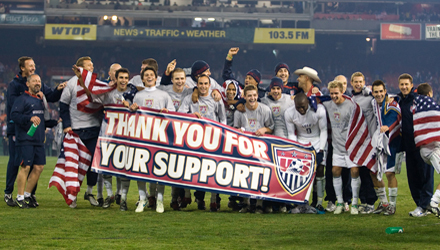 So while you are celebrating the National team&apos;s passage to the 2010 tournament, be sure to log on and show your support for the United States and Tampa at www.GoUSABid.com/TampaBay as well as telling all of your friends and family. Stay tuned in for more World Cup and Tampa Florida News related updates! I&apos;ll be back later this week with an update on things to do in Tampa Bay later in the week!